A monthly series of online educational articles which seek to reduce the growing divide between dermatology clinical practice and the basic science/current research methodologies on which many diagnostic and therapeutic advances are built. The articles are designed for dermatologists and related healthcare providers and will also provide a structured introduction to the topic for dermatology residents and fellows. The pain management and opioid drug crisis presents challenges to many health care professionals. This module will deliver valuable information on addiction medicine. The pain management and opioid drug crisis presents challenges to many health care professionals. This module will deliver valuable information on providing nonpharmacological pain management interventions at the bedside. This module provides 1 credit towards the State of Michigan LARA requirement for education on pain and symptom management. Each forum will feature staff-led presentations of work that represents a positive shift towards a culture of patient and family centered care. All employees at Beaumont have an impact on the patient experience, so we want to hear from all departments at all sites! Sharing our experiences and learning opportunities is vital as we continue working towards becoming the national leader in PFCC. The pain management and opioid drug crisis presents challenges to many health care professionals. This module will deliver valuable information on the role acupuncture plays in the management of pain. This presentation will review the common objections to physician aid in dying from disability advocates and consider what they reveal about the systemic failings of our current health care system. This module is eligible for 1 hour of education on medical ethics. This presentation will describe the historical development of clinical bioethics, explain the four principles of bioethics, and articulate the clinical ethics decision-making framework and how it relates to the principles of bioethics. The pain management and opioid drug crisis presents challenges to many health care professionals. This module will deliver valuable information on interdisciplinary strategies for the challenging patient. This module provides 1.0 credit towards the LARA requirement for pain & symptom management. The pain management and opioid drug crisis presents challenges to many health care professionals. 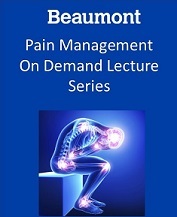 This module will deliver valuable information on pain pharmacotherapy practices. This module provides 1.0 credit towards the LARA requirements for pain & symptom management. The pain management and opioid drug crisis presents challenges to many health care professionals. This module will deliver valuable information on motivational intereviewing strategies. The enduring material is jointly provided by Beaumont Health, American Academy of CME, Inc., and the American Conference for the Treatment of HIV (ACTHIV). The 12th Annual American Conference for the Treatment of HIV (ACTHIV) was held April 5-7, 2018 in Chicago, IL. The conference and web archive was supported by funding from the Clinical Education Initiative, New York State Department of Health, AIDS Institute; and Midwest AIDS Education & Training Center Program as well as educational grants from Gilead Sciences; Janssen Therapeutics, Division of Janssen Products, LP; Merck & Co, and ViiV Healthcare (web portion only). ACTHIV 2018: HIV Epidemiology in the United States: Where is the Epidemic Going? The pain management and opioid drug crisis presents challenges to many health care professionals. This module will deliver valuable information on nonpharmacological pain management strategies. The pain management and opioid drug crisis presents challenges to many health care professionals. This module will deliver valuable information on the role of functional restoration in pain management. Many physicians, in addition to other members of the healthcare team, receive minimal, if any, education regarding how to treat patients with autism during medical school or beyond. Patients with autism spectrum disorder (ASD) often report poorer quality of care and lower satisfaction with their physicians, compared to their non-ASD counterparts. This module is designed to target these gaps in primary care provider knowledge and familiarity with ASD, in hopes to increase the likelihood that providers incorporate ASD- and patient-specific accommodations into their practices, thereby improving the quality of care provided to young adults with Autism. The pain management and opioid drug crisis presents challenges to many health care professionals. This lecture reviews opioid safety, overdoses, and proper disposal. The opioid drug crisis presents challenges to many health care professionals. This lecture provides a review opioid use disorder. This module provides 1.0 credit towards the LARA requirements for pain & symptom management. The opioid drug crisis presents challenges to many health care professionals. This lecture provides a review of the psychosocial risk factors for high-impact chronic pain. The pain management and opioid drug crisis presents challenges to many health care professionals. This lecture reviews the new Michigan opioid legislation, how to complete the opioid legislation requirements in the Beaumont oneChart (Epic) system, and more! This 30-minute module will review the recent Michigan opioid laws going into effect on June 1, 2018. This module provides 0.5 credits towards the LARA requirements for pain & symptom management. Review the challenges of chronic pain management in this 30 minute webinar. This module provides 0.5 credits towards the LARA requirements for medical ethics and pain & symptom management. This online module is limited to Beaumont Providers and Staff Only: The aim of this online module is to give a comprehensive view of human trafficking from the federal perspective. To view the video, click on Content & Tests and then Video. Click Authenticate when prompted; if you are viewing off-site, you will be prompted to login. Please enter your Beaumont network login (i.e., what you use to access Outlook or Epic). If you are viewing from the Beaumont network, you will automatically be logged into Mediasite. After viewing the video, please return to Cloud CME and login to access the Post Test for this presentation. Your Cloud CME login is NOT the same as your Beaumont network login. After you complete the post-test with a score of at least 2/3, you will be awarded 1 CME credit after you complete the evaluation. To view the video, click on Content & Tests and then Video. If you have a Beaumont Network ID and password, click Authenticate when prompted. If you are part of OUWB, please register. After you complete the post-test and achieve a passing score, you will be eligible for credit following completion of the evaluation. The Motivational Interviewing - Risk Assessment course will provide education, activities, and resources to enhance your skills in identifying and counseling adolescents on their risky behaviors. After viewing Pediatric Grand Rounds on Mediasite, please log into Cloud CME to access the Post Test for this presentation. After you complete the post-test with a score of at least 3/5, you will be awarded 1 CME credit after you complete the evaluation. Available to Beaumont Health providers and OUWB faculty and staff only. Disclosure: All individuals involved with this activity have no relevant financial relationships with commercial interests to disclose. This module provides 1.0 credit towards the LARA requirements for medical ethics. This module is designed for all physicians who hold a DEA license to prescribe controlled substances. The module addresses the regulations of the Controlled Substance Act pertaining to a physician's legal right to dispense prescription drugs to patients. This module provides up to 2 continuing education credits toward the State of Michigan requirement for education on pain and symptom management. To access the module, please click the 'Register' or 'Content & Tests' tab. Payment is required in order to access the module. Upon successful registration, you will be returned to the CME portal. Please click on 'CME on Demand', locate the module, and click 'Content & Tests' and then 'Video' button. Upon successful completion of the module, you will be directed to the CME portal where you will complete the process for CME credits.